Send us your worn-out Spade Drill Tips! Regrinding & Recoating service is available!!! MINIMUM ORDER: 10 spade drill tips of the same size and coating. Ask your distributor to include a copy of "Care of Machine Spindles & Tool Holders" for every set-up person and machine operator in your facility. The next time you order 20 Retention Knobs, tell your distributor to include your 4 complimentary labels. More laminated labels are available upon request. Since its founding in 1966, J&M has been known for consistent quality and attention to detail. By manufacturing to tighter tolerances than required by the customer, we set our own quality standards to exceed customer expectations. When purchasing retention knobs (pull studs / retention studs), spade drill toolholders, spade drill tips or retention knob sockets from us, you will be buying quality. Our 98% acceptance rate in quality and delivery is exhibited by multiple awards and recognitions by our customers as star supplier and preferred vendor. Parts manufactured at our facility include those used in aircraft, torpedoes, fuel pumps, and smoldering guns to burner systems. We also manufacture such items as retention knobs (pull studs / retention studs), specialized washers, brake parts for aircraft, navy nuclear, and assemblies for the machine tool industry. Read more about our products. Each an every employee is a member of the J&M Team of experienced, knowledgeable employees. We incorporate the "Team" ethic and in turn, accomplish "winning" results. 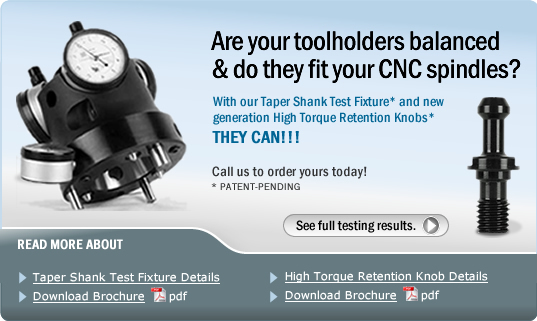 To order High-Torque Retention Knobs, call us or send an email to sales@jmmachineinc.com. Simply use the part number from your present knob and we’ll cross match it with the high torque knob. All materials and photos are Copywritten by J&M Machine, Inc. and may not be downloaded or used without expressed written permission. J&M Machine, Inc. Top supplier of Retention Knobs, Retention Knob Sockets, Spade Drill Tips, Spade Drill Tool Holders & PullStuds. Cleveland, Ohio.